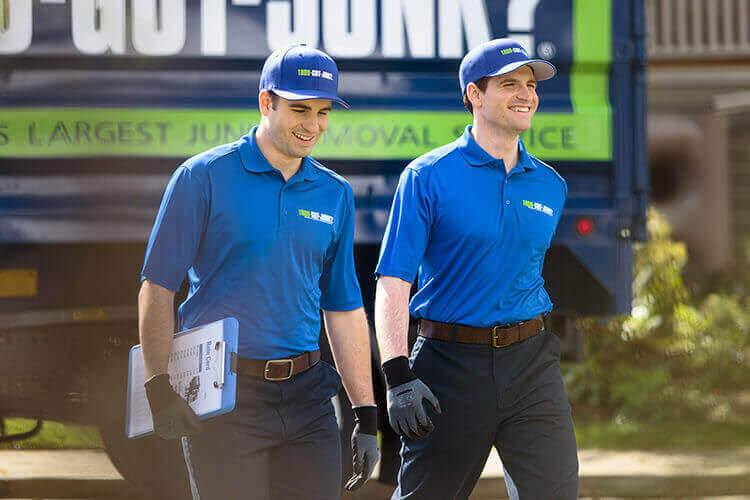 Appliance Removal & Recycling | 1800-GOT-JUNK? If you’ve ever tried to move a fridge or stove, you know it’s a difficult job without help. Aside from the dangers associated with lifting a heavy and unwieldy appliance, improper disposal can also harm the environment. Many old household items contain damaging and harmful chemicals that disperse into the air when left to break down in a landfill. Taking the proper steps to handle your appliance removal responsibly not only preserves your back health, but the health of the environment, too. At 1800-GOT-JUNK?, we’re experts in responsible & sustainable appliance removal. We’ve got the inside scoop on recycling old household items, and the equipment necessary to safely remove your old appliances without you having to damage your back, or your home. And if your old appliance still works, you can feel good in knowing that we’ll donate it to charity. We pick up a wide variety of appliances, including air conditioners, dishwashers, clothes dryers, freezers, refrigerators, stoves, water heaters, washing machines, microwaves, and more. 1. Simply schedule your appliance pick up online or by calling 1800-468-586. 2. Our friendly, uniformed truck team will call you 15-30 minutes before your scheduled 2-hour arrival window. 3. When we arrive, just point to the appliance you want removed and we’ll provide you with an up-front, all-inclusive price. 4. Once you say the word, we’ll remove your appliance from wherever it’s located and finish by cleaning up the area. Plus, we recycle and donate your appliance whenever possible. Only have a single appliance to get rid of? -- Ask us about our single item pricing! When you go with 1-800-GOT-JUNK?, you can feel good in the knowledge that we strive to divert or recycle as much of your old or unwanted appliances as possible; And the best part is all you have to do is point! What Old or Broken Appliances can be Recycled? Most household appliances can be recycled. Larger appliances like refrigerators, washing and drying machines, or ovens are often broken down and used as scrap metal. The metal is then recycled by being separated, then melted down and reused in manufacturing. For larger items, you’ll often need to transport them to the tip or recycling center on your own, since many local household recycling programs aren’t equipped to handle large item pickup. Smaller appliances like toasters, microwaves and cooking pans can often be recycled in local blue bins as they contain recyclable metals. However, the rules vary depending on location. If you have several small items, you may need to take them to a recycling facility. Should Small Appliances be Recycled? Any product containing metal should be recycled. Production of new metals can be costly and damaging to the environment. When we recycle metals, it helps to reduce the environmental impact of using metals. Many smaller appliances also contain substances that can decompose when left to sit in a landfill, releasing gases into the air and other toxins that can contaminate the soil and water supply. Some places mandate that some small appliances be recycled, but even if there isn’t a law in place to prevent these items from ending up in landfills, it’s always important to recycle these items where possible. At 1800-GOT-JUNK?, we’re happy to help you get rid of any unwanted small appliances. We’ll pick up the items for you and ensure they get recycled and properly disposed of. How do I Properly Dispose of Unwanted Appliances? There are many ways to get rid of old appliances. Before you simply throw it out, consider the item’s condition. If it’s still in working order, it’s best to donate it instead of simply throwing it away. It’s best if items keep being used for as long as they’ll last. Many local charities accept appliances of all sizes, and these items often go to people who may not be able to afford brand new items. A second method is to recycle your appliances at local transfer stations or scrap metal recyclers. This means you’ll need a truck, and you’ll also need to load up your items and drop them off yourself. It’s both labor intensive and takes up a lot of your time. Of course, you can always call 1800-GOT-JUNK? when you need to get rid of old appliances. We’ll take care of everything for you—we’ll pick up your items right from where they are, load them into our trucks, and ensure they get donated, recycled, or properly disposed of. How Do I get rid of a Broken or Unwanted Refrigerator? If you have an old refrigerator that still works, it’s best to see if it can be donated. Many local charities accept donations of larger appliances as long as they’re still in working order. If your refrigerator is broken, it will need to be recycled. Research your local area to find out where you’ll need to drop off your fridge for proper recycling. If you can’t drop it off on your own, or simply just don’t have the time, let 1800-GOT-JUNK? handle it for you. We make it easy to get rid of your old refrigerator—we’ll do all the heavy lifting for you, and we’ll make sure it gets to the right place for proper disposal. Can I Throw Away a Microwave? Microwaves are made up of several components like metal, plastic, glass, and electronic elements. All of these substances have the potential to be harmful to the environment if they are left to sit in a landfill. This is why it’s so important to consider recycling or donating your microwave instead of simply throwing it in with your regular rubbish. If your microwave is in good working condition, donating it is always the best option. You might know someone else who can use it, or you can donate it to a local charity. If your microwave no longer works, it can be broken down into its components and recycled. If you need a hand getting your microwave or other unwanted junk recycled, call 1800-GOT-JUNK?. We’re appliance removal experts and will quickly get that junk out of your way. When you work with us, you can rest assured that all your items will be donated, recycled, or properly disposed of.